A simple but capable metronome reminiscent of an older unit that is highly prized. Easily create complex patterns with tenths of a tempo entry. Tap tempo and direct typing make it easy to find and set a tempo. Mix clicks with the associated volume sliders. 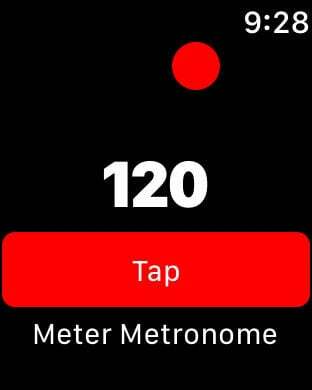 You can also use the Apple Watch app to figure out tempos. You can also set the tempo with digital crown and to visually see the tempo. If you tap the beat indicator you can get a vibration in time with the beat. Just a simple, easy to use metronome. Try it. Sometimes you just want something simple and clean. Press the beat display to turn vibration on - press again to turn it off. Go to watch->Settings->Sounds & Haptics and set Mute to ON to silence the haptic beep.